This 1857 petition for separation from Nelson province was not successful, but another initiative a year later saw a new province – Marlborough – established in 1859. 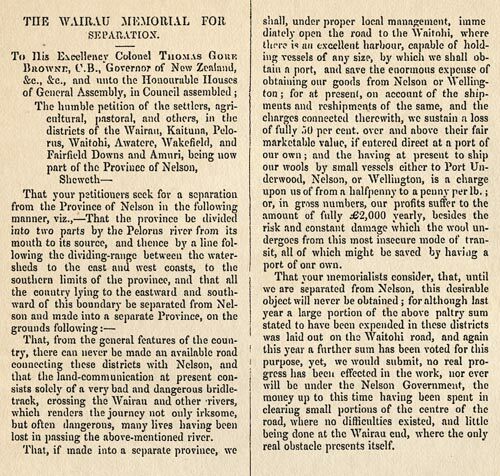 Settlers wanted a separate province because virtually none of the income raised from land sales in the Wairau and neighbouring districts was spent on them (for instance on roads). Runholders also thought a new Nelson council, elected in 1856, was unsympathetic to their interests, particularly in respect of the costs of leasing or buying pastoral land.